In the previous post, We have explained How to Install and Configure MariaDB(MySQL) Database and RabittMq message service which was also a part of the Openstack Deployment. In this post, we will explain you How to Install and Configure keystone for Identity service on node1. OS : CentOS 7.2 - 64 bit. 1. Make sure each hosts are reachable. I make an entries in hosts file only. 2. Verify the internet connection, bcos we use public repos to install these components. 3. Take a backup or snapshot at different stages to restore in case of failure. 4. Stop firewall to avoid issues during the installations (systemctl stop firewalld ; systemctl disable firewalld). Install and Configure keystone for Identity service on node1. Keystone provides authentication and authorization. So every service of OpenStack has to be registered with KeyStone. Create Keystone Database to store its data. Replace "node1" with your controller node name and replace "redhat" with your own database password. Create authentication token to authenticate other services with keystone. 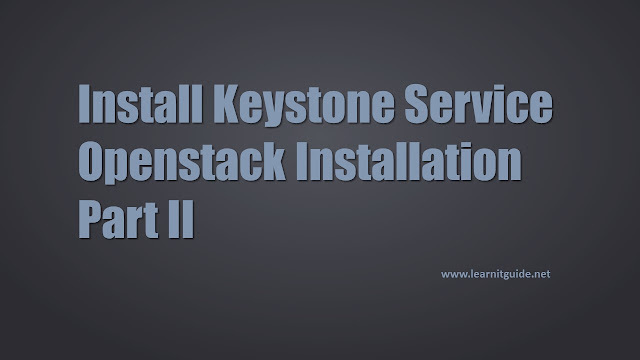 Install the Keystone Packages and other packages. There are two ways to configure the keystone. Option 1. Edit the configuration file /etc/keystone/keystone.conf and change the following paramters. Under [DEFAULT] section, change the admin_token. Under [database] section, Change the database connection parameter. Replace "redhat" with your keystone password and "node1" with your server name. Under [memcache] section, Change the memcached service parameter. Under [token] section, Change the UUID token provider and Memcached driver parameter. Under [revoke] section, Change the SQL revocation driver parameter. Option 2. Use openstack-config command. Change the ServerName directive to reference your controller name in the file /etc/httpd/conf/httpd.conf. Start and enable httpd Service to start when the system boots. The Identity service provides a catalog of services and their locations. Each service that you add to your OpenStack environment requires a service entity and several API endpoints in the catalog. Replace "node1" with your server name. Go to the /usr/share/keystone/keystone-dist-paste.ini file and remove "admin_token_auth" from the [pipeline:public_api], [pipeline:admin_api], and [pipeline:api_v3] sections. If you get the output, then your configuration is working. Create Openstack client environment scripts for the admin and users. Replace "node1" with your server name and replace "redhat" with your database password. We have completed installation and configuration of keystone for Identity service on node1.